Oxalis has ambition and creativity to spare. With a relentless parade of formulaic big-money pachyderm establishments (hello, Hudson Yards!) increasingly crowding the little guy out of the city’s dining scene, the outer boroughs in general and Brooklyn in particular are fast becoming the last refuge in town for a certain type of creative, stylized little restaurant. These operations tend to have the kind of lofty, slightly twee names (Olmsted, Faun, Sunday in Brooklyn) that sound more like boutique stores than actual restaurants. Often there’s a carefully tended herb garden out back and a small bar serving cocktails tinged with esoteric fruit juices and house-brewed bitters. 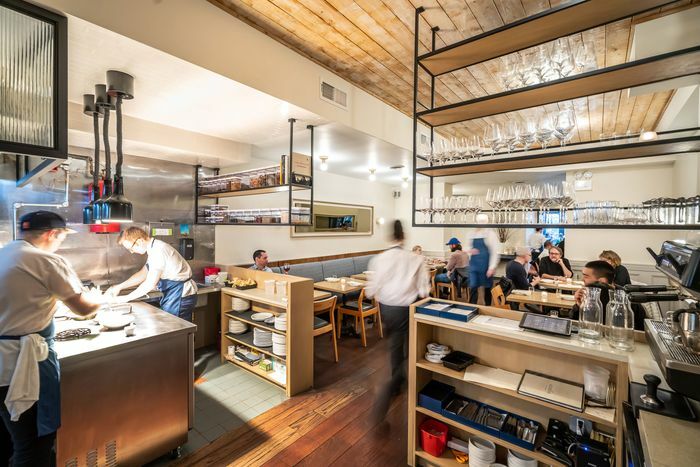 The kitchens are fashionably cramped, as on a high-performance yacht, and occupied by intense young cooks more concerned with fashioning the perfect seasonal-vegetable tasting menu, say, than another high-angle cheeseburger for the ravenous masses. 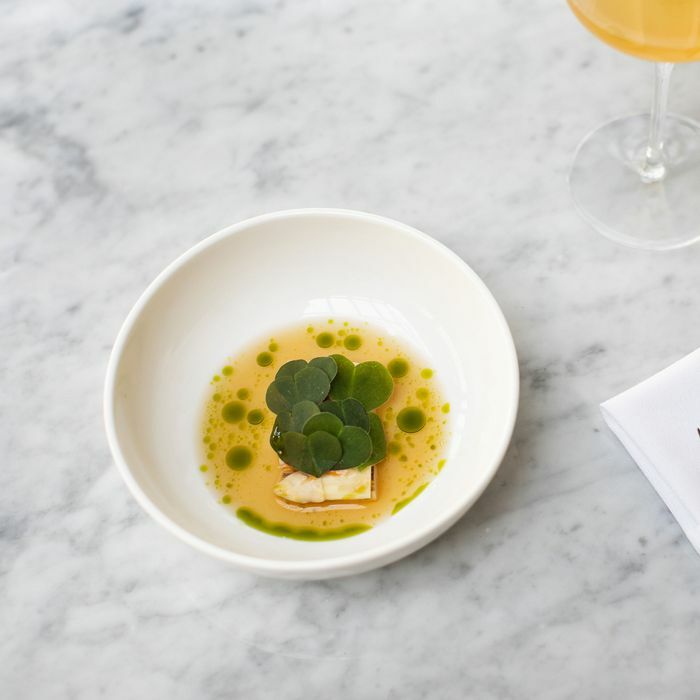 Oxalis, which opened not long ago among a jumble of nondescript storefronts on Washington Avenue in Crown Heights, started life in a very outer-borough, Brooklyn way as a pop-up run by a young chef named Nico Russell. There’s no herb garden out back, as far as I could tell, although they’re in the process of making one, the staff wants us to know. 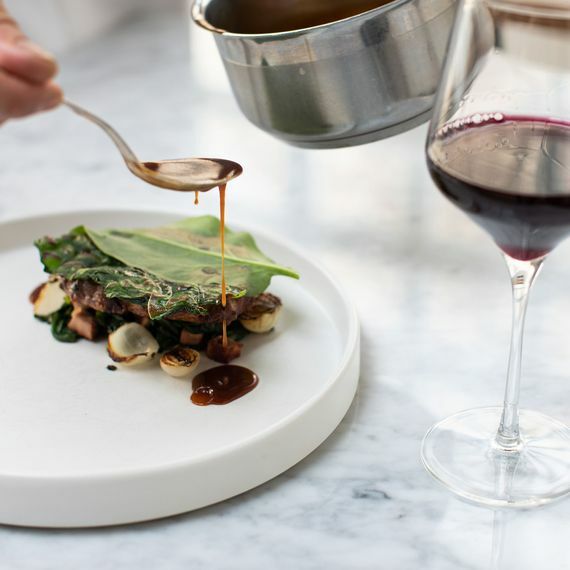 Oxalis is also a sorrel-like herb, for the record, and Russell’s impressive credentials include stints at Daniel and Mirazur in Menton, which, in case you hadn’t heard, is the third-best restaurant in the world. In addition to the usual drinks, you can enjoy a series of nonalcoholic cocktails with names like Jasmine, Citrus, and Spruce at the bar. 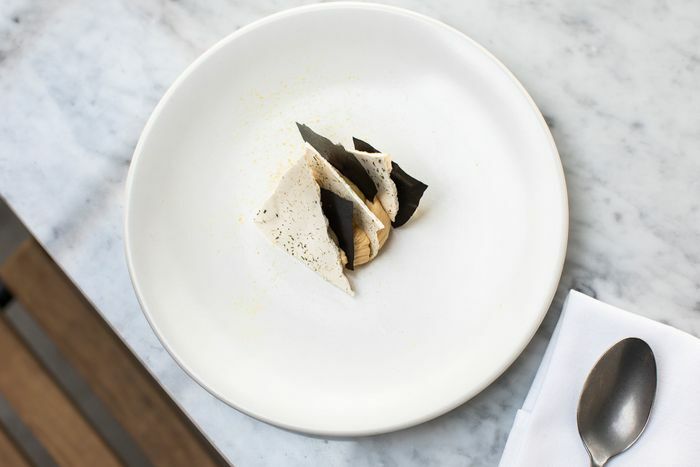 The unconventional bar snacks include a dish called “cabbage, whey, and egg yolk” and bowls of farro garnished with snails, and the only option available in the small dining room is a $60 multicourse tasting menu constructed by the chef himself. This dining room is somewhat awkwardly situated in the long railroad space between the kitchen up front and the bar in the back, and if you’re like me, you’ll agitate for a few of the bar snacks to be brought to your table before the familiar, slightly solemn pageantry of the tasting menu begins. The “cabbage, whey, and egg yolk” formulation is probably not something I’d order again with my very good gin-and-tonic, which lacked an actual lime wedge “for sustainability reasons,” our server explained. 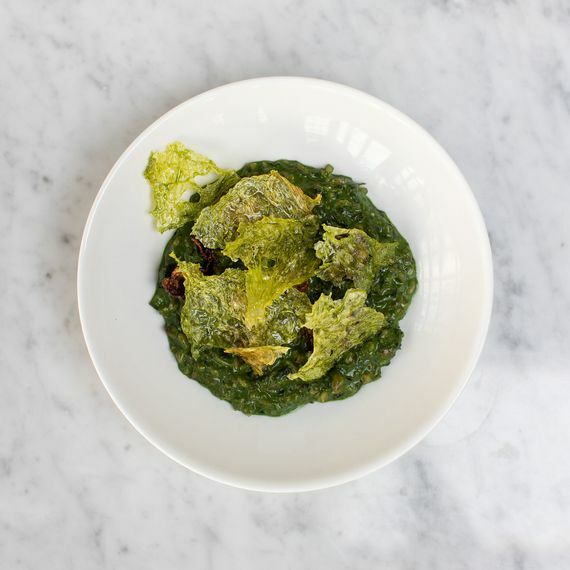 Discerning fans of high-end rustico cooking should enjoy the creamy spinach-colored farro and snails, however (the snails are brought in from Long Island), and if you’re looking for something that vaguely resembles a pub pizza, call for the puffy, fresh-baked flatbread spread with lardo and nettles. 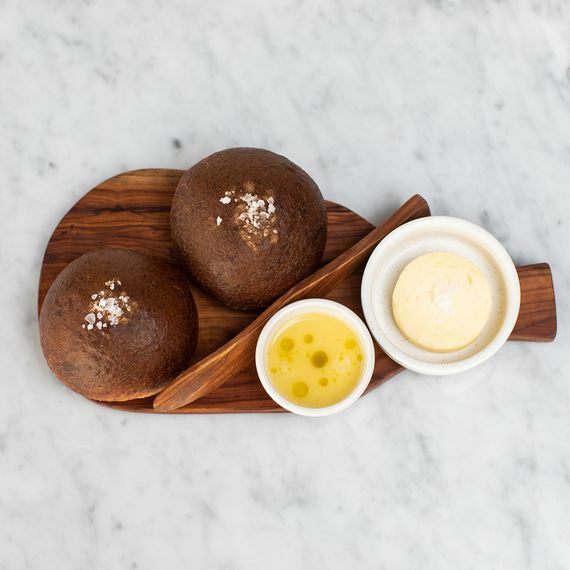 The bar menu's housemade brioche with seasonal “jus” and butter (left) and creamy farro with charred brassicas and snails. Photo: Erinn Springer. Russell belongs to that generation of young, high-minded chefs who prize a rigorous kind of local and seasonal cooking over many of the traditional tricks of the gourmet trade, and his tasting menus are filled with a variety of local ingredients reworked — sometimes deliciously, sometimes a little overaggressively — in all sorts of technically impressive ways. I have dim memories, from my first visit a month or so ago, of a cool, peppery mix of diver scallops tossed with shreds of radishes in an apple broth, and a meaty little pot-au-feu with a medley of mushrooms that was enlivened by a dose of melted bone marrow. The most memorably delicious thing by far was a single vermilion slice of duck breast, which Russell and his cooks age to a delicate gaminess for several days, crisp on its Peking-duck-like fatty top, and serve with a cooling garnish of yogurt mingled with sweet potatoes. The “carte blanche” tasting menu at Oxalis turns over every month or so, which means this subtle, wintry duck dinner had disappeared the next time I visited, replaced by a slightly more ambitious combination of late-winter/early-spring recipes and ingredients. Instead of the scallops-and-radish combination, we enjoyed white asparagus set in a cool dashi broth and topped with bits of uni, followed by a strangely bitter, slightly less enjoyable helping of shredded “rutabaga noodles” obscured in a wet foam flavored with Fontina cheese. Small servings of gently smoked steelhead trout arrived after that (garnished with cracklings of trout-skin chicharrón and a buttery sauce touched with bergamot and herbs), followed by thin ribbons of a beef shoulder that had been slow-cooked for the better part of an entire day, then plated with spring onions interspersed here and there with tasty little nodules of bone marrow. Russell calls his restaurant a “neighborhood bistro,” and although his brand of refined, somewhat stagy cooking might not be worth a special pilgrimage out to Crown Heights for the crowds of highbrow big-city gourmets from across the river, you could do a lot worse for your 60 bucks these days in the hot new dining addresses around Manhattan. The best dessert I tasted at Oxalis was the last one — a twirl of creamy white-chocolate mousse stuck with small shingles of meringue with a deposit of Meyer-lemon curd in its middle — which I enjoyed with the last dregs of one of the tart, fizzy “skin contact” wines. The best bar dish, for those of you not wild about snails or lardo flatbread, was the helping of slow-cooked pork neck, although I’m sure I speak for a few local regulars in wishing that one day this talented young cook will find his way to devising a modest neighborhood cheeseburger. 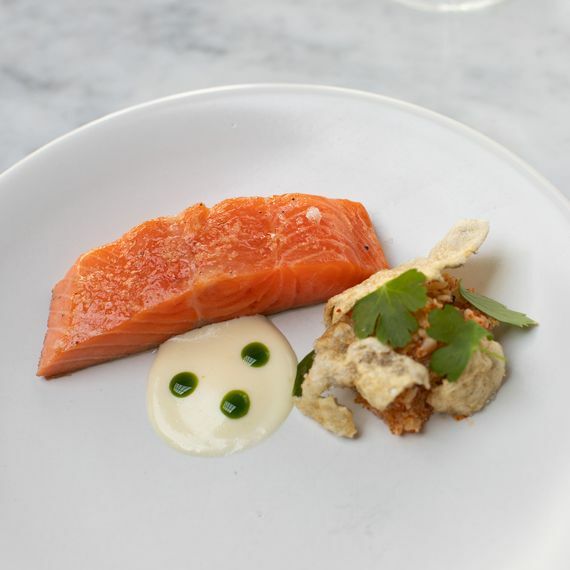 The tasting menu's trout with bergamot sauce, cauliflower, and trout-skin chips (left) and the barroom's slow-cooked pork neck with mortadella ragoût and a sauce of smoked paprika and fermented tomato juice. Photo: Erinn Springer. Prices: Tasting menu, $60; bar-menu dishes, $8 to $23. Ideal Meal: New dishes are added weekly, but of those we tasted, our favorites were the mushroom broth, the steelhead trout, the duck, and the white-chocolate mousse for dessert. The housemade brioche on the bar menu is also excellent. Note: Booker and Dax alum Piper Kristensen offers two beverage pairings ($35 with alcohol, $20 without), both of which are worth the money. Scratchpad: The innovation, technique, and good old-fashioned bang for the buck all add up to a very good 84 rating on our newfangled scale of gourmet achievement. *This article appears in the April 2, 2019, issue of New York Magazine. Subscribe Now!